Posts tagged "Moet et Chandon"
Updated – Champagne Names – How to pronounce them? You are planning a private luxury yacht charter at the Cannes Film Festival in the South of France (pronounced CAN…..not con), and you want to pronounce all champagnes correctly when working with your onboard superyacht Sommelier. Thanks to our friends at Glass of Bubbly, we are sharing this helpful and informative blog post about correct pronunciation of champagne names with you. 4-24-18 – UPDATED — Taittinger Champagne has been added to the list, since it’s phenomenally popular. << Are You Pronouncing These Champagne Names Correctly? When Champagne gets transported into another country, it’s normal that the pronunciation is adapted to suit the language. However, if you’re curious how to pronounce Champagne names comme il faut (translated = properly), you’re in the right place. Even if you’re quite confident with French, the names can sometimes be tricky as many originate from other countries such as Germany. Tip: “on” and “om” sounds are usually nasal sounds in French, such as in Dom Pérignon. The one that probably causes the most trip-ups is Moët et Chandon, which is pronounced moh-et eh chan-dawn – and not the commonly-said moh-way… oops. Remember. The city of Cannes, France is simply pronounced “can” (not “con”). The Cannes Film Festival is pronounced CAN, not cahn. The next step? Contact 1-800 Yacht Charters at 305-720-7245 or by filling out our convenient online contact form at https://www.1800yachtcharters.com/book-now/, and start planning your yacht charter vacation today! Is there anything that speaks to the joy of “la bonne vie” as perfectly as enjoying a glass of champagne while onboard a yacht at sea? 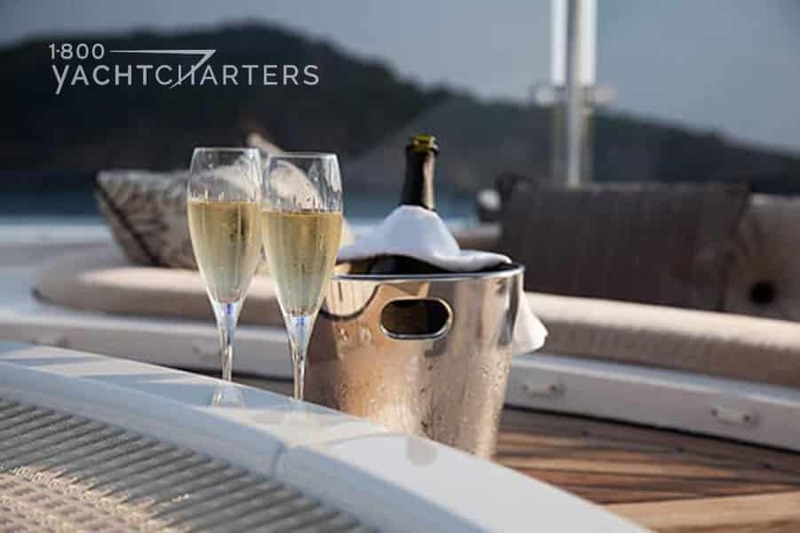 Time aboard a luxury yacht charter vessel is the perfect platform to reconnect with friends and family – and champagne is often the tonic of this celebratory time together. It’s a simple, balanced champagne with a pleasant aroma, and hints of a Cognac-like richness. A 2006 vintage 750ml bottle is priced at approximately $150. A 750ml bottle of the 1996 Rosé “P2” is priced at approximately $795. A FUN SIDE NOTE: Why do we call it a “toast?” Thanks to Wikipedia, “According to other stories, the word toast became associated with the custom in the 17th century, based on a custom of flavoring drinks with spiced toast. The word originally referred to the lady in whose honor the drink was proposed, her name being seen as figuratively flavoring the drink. A 750ml bottle of the 2009 Louis Roederer, Cristal is priced at approximately $250. 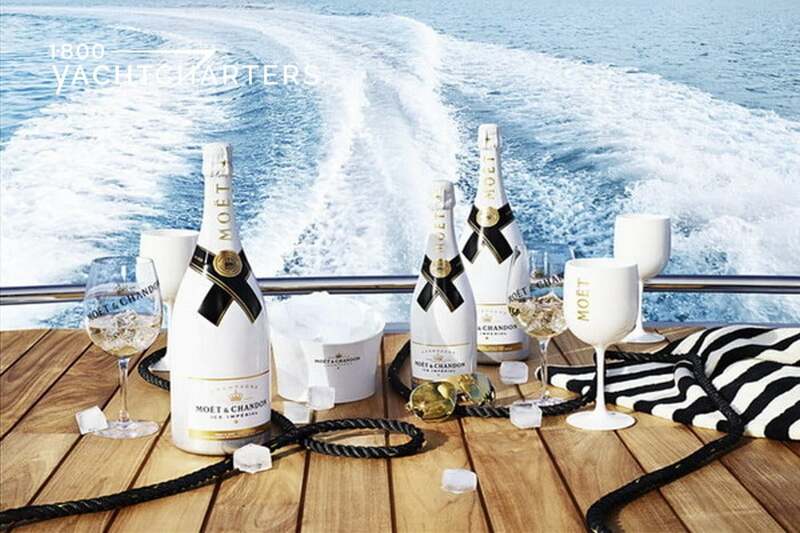 It seems every food and beverage preference sheet submitted by clients prior to their winter St. Barts yacht charter vacation has listed Moët Ice as a “must-have” item. Launched in early 2016 as a summer indulgence, the popularity has not waned. So what makes this champagne so unique? The answer is “ICE.” This champagne was designed to be served with ice, and that was a real innovation in the world of sommeliers. Ice has a rich fruity taste, perfect for warm weather winter charter destinations such as the Caribbean and the Bahamas. Moet Ice Imperial champagne is a special blend consisting mainly of Pinot Noir (40-50%), Pinot Meunier (30-40%), and Chardonnay (10-20%). It is suggested to be served with three ice cubes in tall glasses of Cabernet, and can be mixed with other refreshing ingredients such as mint leaves, lemon peel, cucumber, or cardamom seeds – to enhance the intensity of flavor, and the icy freshness. A perfect tropical indulgence. One of the great benefits of The Superyacht Experience is the ability to customize every aspect of your luxury yacht charter vacation – from where you go, to what you do, for rest and recreation. Of course, this includes your preferences for foods and beverages as well. So, while we are happy to share the popular brands and trends that we see selected by our clients, YOU have the ultimate say. The Superyacht Experience is a bespoke vacation like no other! 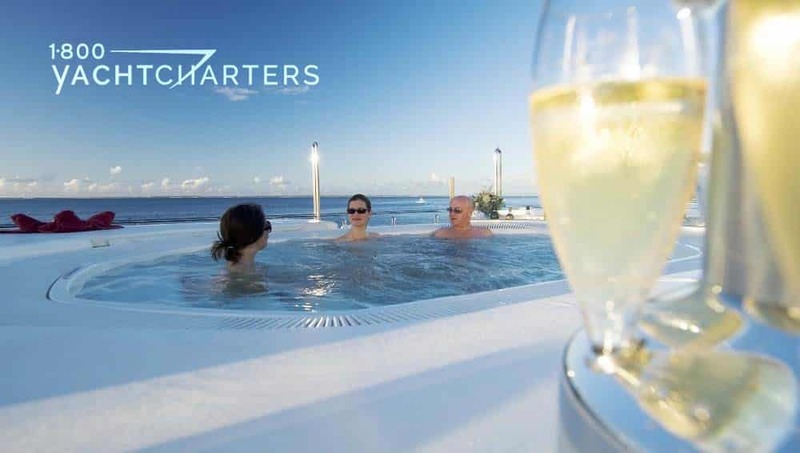 To plan your own custom-tailored yachting holiday, call us at 1-800 YACHT CHARTERS (1-800-922-4824) or fill out our convenient online contact form at https://www.1800yachtcharters.com/book-now-contact-us/. HURRY – the best luxury yachts book quickly!